Rhodes is a diverse and colorful island - and never dull! Explore the classic natural beauties and the remote, hidden on the mountains destinations and historical locations! The mild climate, the regenerating sun, the numerous freshwater springs and the refreshing sea breeze allow more than 1000 tree and plant species to thrive on the island, numerous vegetable and fruit species to be cultivated and a variety of bird and animal species to live. The Butterfly Valley, a unique biotope of rare natural beauty and enormous ecological value as a habitat for the butterfly Panaxia Quadripunctaria, is a popular destination for thousands of visitors to the island of Rhodes. Also worth a visit: The Museum of Natural History of Rhodes Island - located directly at the entrance of the valley where visitors have the opportunity to discover the secrets of a unique ecosystem. In the freshwater rivers of the island lives the endemic fish species Ghizani, which bears the name of the scientist who discovered it on the island (Ladigesocypris Ghigii). The small horses in Archangelos have been living for some time in a semi-wild state in the lush green forests of the region. Their size varies from 0.80 to 1.20 m. They have a black, brown or reddish brown colour. Today there are hardly more than 10 animals that are protected in an enclosure. The Prophet Elias Mountain is richly blessed with pine and cypress trees, rare bush and plant species such as the Paeonia Rhodia and numerous orchids (10 orchid species are endemic plants). Due to the important monuments and the unique landscape of the regions from Kamiros to the mountains of the Prophet Elias, Atavyros, Akramyti, Kymisala, Vasilikos as well as Fourni and Prasonisi, they are part of the nature conservation programme of the EU NATURA 2000. 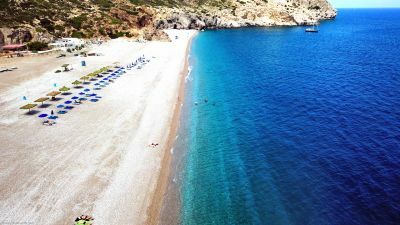 Under the same programme, sections of the sea of the region where the sea turtle Caretta Caretta and the Mediterranean seal Monachus Monachus live and reproduce are also protected, as is the air route of the birds to the south leading to warmer countries, with a stopover in Prasonisi.